4, Thursday 11 April: The Articles of Religion (the 39 Articles). This evening we are looking at the Articles of Faith, or the 39 Articles. Although it is not one of the ‘Ecumenical Creeds,’ such as the Apostles’ Creed, the Nicene Creed or the Athanasian Creed, they are often interpreted as setting the parameters of Anglican doctrine and theology. So, this evening we are looking the 39 Articles, their origins, how we use them, asking how definitive they have been for Anglicanism, looking at their strengths and their weaknesses, and looking at how they are ‘received’ or used today. When the Revd Gary Paulsen was being instituted as Rector of Fermoy, Co Cork, last Sunday afternoon, the booklet reminded us that ‘all clergy, on being ordained, instituted or licensed, are required by the Constitution of the Church of Ireland to subscribe the Declaration’ in which they ‘solemnly declare’ a number of points of doctrine and authority in the Church of Ireland. 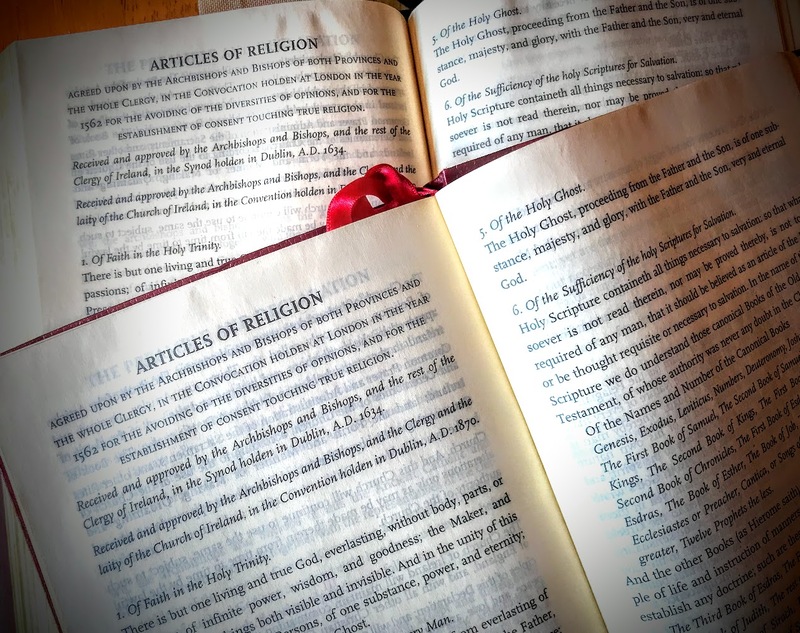 In other words, three historical documents – the 39 Articles, the Book of Common Prayer and the ordinal – contain the doctrine of the Church of Ireland, and where they do so, they are agreeable to the Word of God. But that does not mean everything in those three documents has doctrinal authority in the Church of Ireland. Nor do members of the laity have to sign any declaration like this at any time. I often wonder what strangers visiting our parish churches think when they open the Book of Common Prayer, pore over its pages, and read some of the words and language in the 39 Articles, found on pp 778-789, a total of 12 pages. I am happy that the Church of Ireland owns and enjoys its history. But is a prayer book the appropriate place to publish the words written in another age without explaining their original context? The then Dean of Armagh, the Very Rev Patrick Rooke (now Bishop of Tuam), and Mr Dermot O’Callaghan, one of the leading lay members of the General Synod, tried to put things to right at General Synod in 2008 with a proposal that all future editions of the Book of Common Prayer should include a Declaration immediately preceding the Articles of Religion. This declaration puts the 39 Articles in their historical context. The language used about Roman Catholics and Anabaptists were typical of the polemics of the day, but it sounds offensive today. During the debate, the Bishop of Cashel and Ossory, Bishop Michael Burrows wondered how Anglican understandings of truth are best defended by being rude to others. The then Archbishop of Dublin, Dr John Neill, pointed out it is impossible to rewrite historic documents that have been important landmarks on the journey. ‘The Church of Ireland is part of the one, holy, catholic, and apostolic Church, worshipping the one true God – Father, Son, and Holy Spirit. It professes the faith uniquely revealed in the Holy Scriptures and set forth in the catholic creeds: which faith the Church is called upon to proclaim afresh in each generation. Led by the Holy Spirit, it has borne witness to Christian truth in its historic formularies – the Thirty–nine Articles of Religion, the Book of Common Prayer, the Ordering of Bishops, Priests and Deacons and the Declaration prefixed to the Statutes of the Church of Ireland (1870). ‘These historic formularies are a definition of the faith as proclaimed by the Church of Ireland, and thus form an important part of the inheritance through which this Church has been formed in its faith and witness to this day. The formularies that have been passed on are part of a living tradition that today must face new challenges and grasp fresh opportunities. ‘Historic documents often stem from periods of deep separation between Christian Churches. Whilst, in spite of a real degree of convergence, distinct differences remain, the tone and tenor of the language of the negative statements towards other Christians should not be seen as representing the spirit of this Church today. ‘The Church of Ireland affirms all in its tradition that witnesses to the truth of the Gospel. It regrets that words written in another age and in a different context should be used in a manner hurtful to or antagonistic towards other Christians. ● the publication of the first Book of Common Prayer (1549). But Anglicanism is not just a product of the Reformation in England. It is also an experience of the Church in Wales, Scotland and Ireland too. And, if the English language or some links with British sovereignty does not define ‘Anglicanism,’ then adherence to the Book of Common Prayer or the 39 Articles does not provide that definition either. The 39 Articles were not adopted by the Church of Ireland until a convocation in 1634, and the Irish canons had to be redrafted to conform to the English ones rather than replaced by them. The Scottish liturgy, which was considerably ‘higher’ than the 1662 Book of Common Prayer, influenced and shaped the liturgy of the Episcopal Church in the US (TEC). For a long time, the 39 Articles were not part of the tradition of the Scottish Episcopal Church until 1811, and when they were adopted by the Episcopal Church in the US, they were modified to delete all references to the English sovereign. In 1968, the Lambeth Conference of Anglican bishops asked the member churches of the Anglican Communion to consider whether the 39 Articles need to be bound up with the Book of Common Prayer, suggested that assent to the 39 Articles should no longer be required of ordinands, and suggested that where subscription is required and given, it is only in the context of setting them in their historical context. At the Disestablishment of the Church of Ireland, the Preamble and Declaration became constitutionally self-defining for the Church of Ireland (see the Book of Common Prayer pp 776-779). Paul Avis, in his book The Identity of Anglicanism: Essentials of Anglican Ecclesiology (London: T&T Clark/Continuum, 2007, pp 160-162), lists the principal sources (indicative rather than definitive texts) that are relevant to Anglican ecclesiology. They include the historic formularies (i.e., the 39 Articles, the 1662 Book of Common Prayer and the 1550/1662 Ordinal). Articles 1-5: Do they supplement, replace, express the three Creeds we have been looking at over the past few weeks? Article 6: Are all these books identifiable with the Old Testament books we know today. The Apocryphal books should be read ‘for example of life and instruction of manners.’ Is this list accurate. Article 8: Here the three creeds we have been looking at are named. Article 19: Constantinople, Jerusalem, Antioch, Alexandria and Rome were the five traditional patriarchates of the Church. Why is Constantinople omitted? As Anglicans, have we ever broken communion with any part of the Church? Article 20: How broad are our ecumenical tolerance and acceptance? Article 24: This could also mean that we should language of today in our liturgy and in the translations of the Bible we read. Article 35: Is this a limit to or a guide for sermons? Article 37: How should this be read in the Republic of Ireland, or in other places outside England?